"Alexander and Aristotle." Digital image. Wikipedia Commons. Accessed August 20, 2010. http://en.wikipedia.org/wiki/File:Alexander_and_Aristotle.jpg. Alexander Mosaic. Naples National Archaeological Museum. Altdorfer, Albrecht. Alexander: Battle at Issus. 1529. Alte Pinakothek, Munich, Germany. Levy, Michael, performer. "Hymn to the Muse." In An Ancient Lyre. Michael Levy. 2009, MP3. Mahwash. "Gar Konad Saheb-E-Man (If My Eyes Meet The Ones Of The Lord)." By Saheb & Ustad M Sarahang. Recorded November 11, 2003. In Radio Kaboul. 2003, CD. PHGCOM. "Alexander Coin." Digital image. Wikipedia Commons. Accessed August 20, 2010. http://commons.wikimedia.org/wiki/File:AlexanderCoin.jpg. Rode, Bernhard. Alexander Covers the Body of Darius with His Cloak. 1769-70. Die Kataloge Der Berliner Akademie-Ausstellungen 1786-1850, Ed. by H. Börsch-Supan, Vol. 1. "Silver Tetradrachm of Agathocles." Digital image. The British Museum. Accessed August 20, 2010. http://www.britishmuseum.org/explore/highlights/highlight_objects/cm/s/silver_tetradrachm_of_agathocl.aspx. Von Niedermayer, Oskar. Citadel in Herat. 1916. Fine Arts Library of the Harvard College Library, Cambridge, MA. Before Tamerlane and Babur, before Chinghis Khan, and Ashokha before him, there was one man who built empires unlike any other. His name was Alexander, and he extended the Greek city state of Athens to become an empire that stemmed from the Nile to the Indus. He did all this before his 25th birthday. The Greek historian Plutarch wrote a biography of Alexander in the centuries following his rule. According to the book The Life of Alexander, the young Macedonian was said to be a descendent of Hercules, and was educated by Aristotle. Alexander famously said that he was indebted to his father for living, but was indebted to his teachers for living well. Perhaps it was his sense of birthright power, or perhaps a pursuit of riches, that compelled the young Alexander to conquer vast stretches of land to the east. He as he moved through the Middle East, into Peria, he pursued in battle various Shahs in the region–including Darius III, King of Persia. Darius died in battle. Although Alexander did not kill him, Alexander claimed victory and took the title Shahanshah, or the King of Kings. "In the 4th century BC Alexander the Great, one of the greatest conquerors in world history began to move eastward from Greece and was extraordinarily successful occupying a vast domain stretching from Greece all the way to Afghanistan. He actually occupied and took over Afghanistan within six months and began a process of bringing Afghanistan into the Greek world. 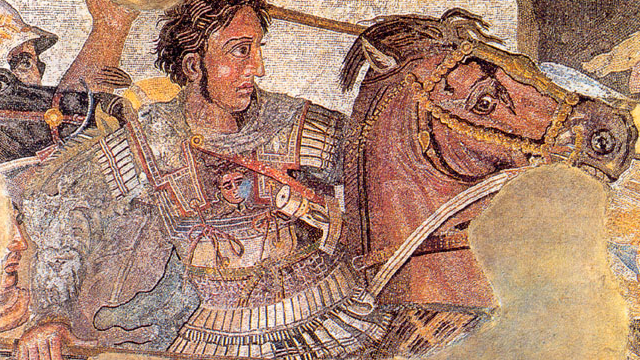 Alexander the Great’s conquests brought Afghanistan new cultural developments in many aspects of life and society that reflected Greek traditions." Although Greek influence was heavily felt, a native Persian style persisted. What resulted was a hybrid of Greek and native traditions. "That’s one of Afghanistan’s glories, hybrids: the integration of a variety of different cultural motifs. The Greeks, when they arrived with the invasion from Alexander did stay in Afghanistan and intermarried with the local people creating a fusion. "The local people who were subjugated by the Greeks, of course, were influenced by the Greeks but a lot of their traditional Iranian culture persisted. Whatever accommodations they made to the Greeks and whatever they borrowed from the Greeks had to fit in with their traditional beliefs, their traditional values, and their traditional lifestyle. They would choose what they wanted from Greek civilization and would opt out of certain aspects of Greek civilization that didn’t jive or fit in with their culture. That would happen repeatedly throughout Afghan history." Alexander went on to conquer parts of India and was on his way to Arabia when he died. The Greek influence in the region persisted, however, for centuries to come. Alexander the Great created the greatest empire in the world—planting Greek cities throughout Eurasia that would exert influence for centuries to come. He did all that by the age of 25.